Maker Faire Shenzhen, held the first weekend of April 2014, celebrated the emergence of the maker movement in China and recognized the significance of Shenzhen as a global capital for makers. In recent years, Shenzhen has attracted makers from around the world who arrive like apprentices eager to learn about manufacturing and tap into the vast resources of the Shenzhen ecosystem. Maker Faire Shenzhen was the first full-scale Maker Faire in China. An estimated 30,000 people walked the tree-lined streets to interact with makers, participate in workshops and listen to presentations. Maker Faire Shenzhen was a showcase for 300 makers who manned 120 exhibits. Organized by Eric Pan and his team at Seeed Studio, Maker Faire Shenzhen was a public demonstration of the robust productivity of China’s makers. The maker movement could play a major role in China in transforming both China’s view of itself and the world’s view of China as a center of innovation. As a founder of Maker Faire, I was proud to see Maker Faire Shenzhen myself, participate as a speaker and learn what making means to others in China. Colorful banners were hung from nearby buildings. A Family Friendly Festival and a Celebration of the Maker Movement. A Bumblebee Transformer-like robot sculpture. The Making Cafe was one of the coffee shops along the street. Chris Anderson spoke about makers and 3D Robotics. Tom Igoe talked about the origins of the Arduino project and some of the student projects at NYU’s ITP. Young makers checking out the robots. Shannon Hoover of Calgary, Alberta Canada and his wife helped run the Make Fashion booth with the Wearables Lab from Hong Kong Baptist University. 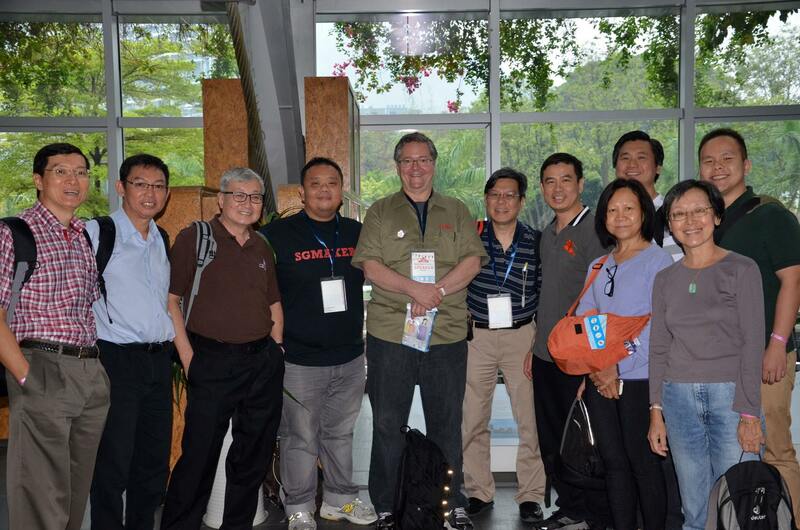 Brian Smith (second from left) is a teacher in Hong Kong. He came with his family, including his daughter Mady, and some friends. DFRobot sells robots and other hardware. There were tables set up for workshops. Joe Schlesinger from Arcbotics has been in Shenzhen for 8 months. Lyn Jeffrey from Institute from the Future spoke about the maker movement in China. Lyn Jeffrey looked at the Maker Movement and “Shanzai” in Shenzhen. Umbrellas were out on a rainy first day. The rain didn’t stop people from taking pictures with Makey. Eric Pan of Seeed Studio, the organizer of Maker Faire Shenzhen, addressed the Forum audience. Sylvia Lindtner of Hacked Matter has been studying the Maker Movement in China. This jean-covered car was part of an exhibit on Open Source Vehicles. This smart cigarette lighter will keep track of a person’s smoking habits to help a person reduce smoking. This device can measure your tennis swing. A custom Maker Faire badge, an open source project from wyolum.com. Protei is an open source ocean exploration platform. DJI is a maker of drones and other kinds of robots. Beijing Makerspace had an exhibit. An intent young boy works on soldering. Small compressed-air rockets were launched. This group of students produced Frank, a telepresence robot. Zach Hoeken Smith of HXCLR8R with Dale. A local crafter was invited to set up inside of Maker Faire Shenzhen. The UK had a booth featuring UK makers. Many booths had products such as gadgets to sell. The merch booth at Maker Faire Shenzhen was run by Seeed Studio. One of several 3D printing exhibits. One of the creations made from the MakeBlock construction system. Jasen Wang, CEO of MakeBlock. Alex Hornstein exhibited a messy 3D painter bot. Techspace is a commercial makerspace in Shenzhen. Handuino is the name of project for a remote controlled hands. The Dexta Robotics Team from Nanjing. Vincent Wang, Executive Chairman of Foxconn, said that Foxconn would begin to work with makers. Makers from Singapore and Malaysia were at my talk. Kevin Lau was the man behind the scenes for Seeed Studio, making the event run smoothly. “This event has so many meanings for us,” Eric told me after the event. “It is important for growing the ecosystem.” He said that most of China’s makers have never been to a Maker Faire, so bringing it to them was valuable. All the members of his 160-person company were involved in producing the event under the lead of Kevin Lau. The event gave everyone at Seeed Studio the opportunity to develop relationships directly with makers and the maker community. “It is good training,” he added. 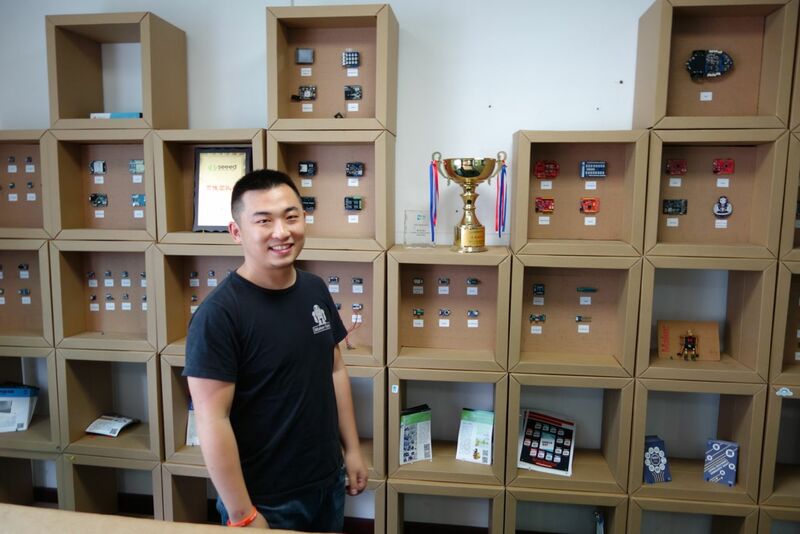 Named by Forbes to China’s 30 under 30 list, Eric Pan started Seeed Studio in his apartment in 2008 and has grown rapidly, selling mostly electronic products that they make themselves. They also provide custom services to makers to help them develop and manufacture a product. As a commercial manufacturing center, Shenzhen is not much older than Eric. Thirty years ago, it was a fishing village in the shadow of Hong Kong. The Chinese government set up Shenzhen as a special economic zone, a grand experiment in capitalism that created a boom-town. Today, the factories that were once located in the city have moved outside the city limits and the old factories have become shops, residences and museums — all in less than 30 years. Shenzhen continues to attract others like Eric from elsewhere in China because this is a place where things change fast. Maker Faire Shenzhen was held mostly outside and their first day was rainy, and umbrellas were required. The rain didn’t seem to keep people away, however, although it made it a little harder for makers. When I asked Eric if anything about this Maker Faire surprised him, he said “that it stopped raining.” The second day, which was a Monday and the third of a 3-day weekend holiday, was dry and more enjoyable. Maker Faire Shenzhen had its assortment of 3D printers, electronics, vehicles, games and robots, much like what you’d see at any Maker Faire. Many commented that the makers were more commercial — from the start, they saw themselves as creating a product that could be sold. Eric Pan said that he thought that more creative makers and individual projects that weren’t done for commercial reasons would come later on, as the movement matured out in China. If so, it might develop in opposite fashion from the US where the creative pursuits of hobbyist have over time developed into new business opportunities. There were plenty of activities as well as student projects. I had two favorite student projects. One was a group of university students who had built a telepresence robot called Frank. One of the team members said that they were showing the fifth generation of Frank. The Dexta Robotics team from Nanjing showed a project that is temporarily called Handuino, which is an apparatus for your hand that allows you to control a robotic hand. The founder of the company, Aler Gu, garduated from high school last year and has taken a year off to work on this project before heading to Cambridge University in the fall to study Mechanical Engineering. Aler sees possible industrial uses for a remotely controlled hand as well as a new interface for games. They are preparing an injection-molded version of the hand soon, and then will launch a Kickstarter. One important takeaway I had from Maker Faire Shenzhen has to do with Kickstarter. Consider this. If you launch a product on Kickstarter, there’s a good chance that before your Kickstarter closes, someone in China will have taken your design, modified it for manufacturing and produced a version of your thing, something that will take you nearly a year or more to produce after you’ve been funded. Now, one might think that it is just about copying or cloning. Rather, it is because the resources for making anything are so widely available in China, and the expertise is so broad, they are hungry for new ideas and they can turn them into products faster than anywhere. It is speed combined with efficiency that drives innovation in China. What happens when China’s makers start adding the kind of creativity and design that is valued in the West as a competitive advantage? Shenzhen also has its own mindset called “shanzhai,” which several speakers addressed in presentations. Silvia Lindtner, an Austrian at UC Irvine and a co-founder of a Shanghai-base research group called HackedMatter, has been studying shanzai and sees it as a parallel development to the maker movement in China. Sylvia elaborated on shanzai in an email message. Shanzhai is rooted in a highly distributed social network of factories, vendors, component producers, component traders, and design houses that share an approach to open sharing in many ways compatible with the global maker movement. David Li describes this as open source with Chinese characteristics; an open approach to manufacturing motivated by necessity rather than countercultural ideas. For instance, in the shanzhai ecosystem people work with open reference boards (gongban in chinese), open BOM (bill of materials) as well as open designs of form factors. This open process in manufacturing has allowed Chinese companies like Allwinner and Rockchip to innovate fast and become leaders in the non-ipad tablet market, competing with international corporations like Intel. Chinese makers and open hardware startups like Tom Cubie from Radxa are designing technologies that bridge these two spaces of open source, the shanzhai open manufacturing ecosystem and the global maker movement, enabling makers to design new products with more powerful hardware. The biggest news for Maker Faire Shenzhen is that Foxconn sponsored the event, along with PCH International and Huaqiang, which operates the largest factory inside the city limits of Shenzhen. The Executive Chairman of Foxconn, Vincent Wang, spoke at Maker Faire. He said that his company wanted to be involved in the event and listen to makers and learn from them. 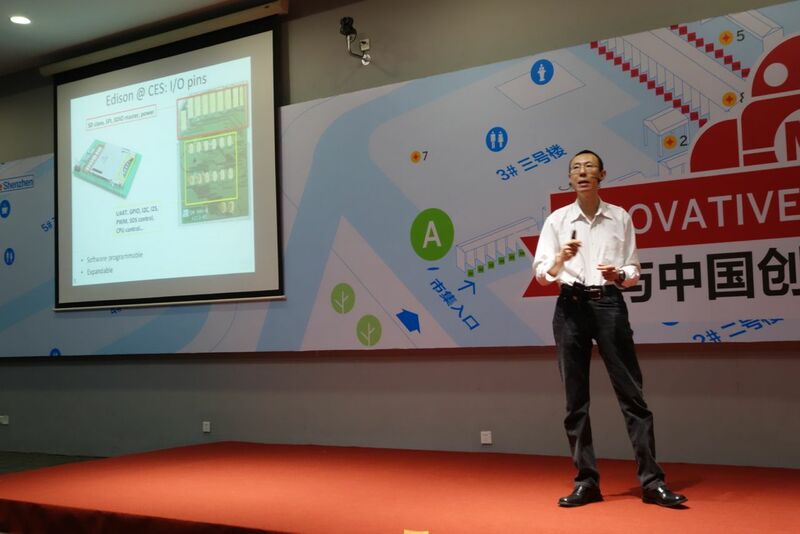 His colleague, Jack Lin, said that in the past Foxconn would not work with makers but five months ago, they have opened a new business unit to focus on makers. They have also created a new fabrication facility in Beijing that can be used to prototype new products. Randolph Wang of Intel Labs China introduces the Edison board. Companies like Intel have a significant presence in Shenzhen. Randolph Wang of Intel Labs China is developing a new product called Edison, which is a computer the size of an SD card. “Edison offers a unique combination, ” said Wang. “It is small and powerful.” Edison has the potential to be an important new platform for makers. Wang said that it can be used both for prototyping and for the final product. Wang showed a number of sample applications developed within Intel Labs China, such as a paper notebook that was powered by Edison. A demo showed a person writing a message on paper that was interpreted as an email and sent by Edison. The demo showed how a freehand drawing could be captured as image and text. Edison is not yet available but we will be watching its development closely. Ian Lesnet from Dangerous Prototypes lived in Amsterdam for 10 years. He came to visit Shenzhen and he said that he “threw away the other half of my round trip ticket and decided to stay.” He’s been there two years. Joe Schlesinger of Arcbotics moved to Shenzhen from Boston about eight months ago to work on his open source robotics platform. Alex Hornstein from Boston had moved to Hong Kong several years ago where he worked on the Solar Pocket Factory. Now he lives near Shenzhen. He called his project the messiest one at Maker Faire — a 3D painter bot that prints with colored corn syrup. Alex was right. A sticky ooze was seeping out on the ground below his table. Zach Hoeken Smith is another American who came to Shenzhen. One of the co-founders of MakerBot, he went to China to explore manufacturing options for the company and decided to stay, even after parting ways with MakerBot. Like many who move there, he’s learning the language and loving it. Eric Pan says that Zach is “more Chinese than I am.” He says Zach rides motorscooters around town like he’s lived there forever and it is something that Eric says he would never do himself. Zach told me that moving to Shenzhen “means I’m learning something new every day, and that feels great.” Zach is a hands-on advisor for HAXLR8R, a Shenzhen-based accelerator for hardware startups founded by Cyril Ebersweiler. HAXLR8R located in a very crowded office tower (judging from my ride in the elevators) near the electronics market in Huanqiang Bei. They have 11 companies in the current group. I met two of these companies at Maker Faire. One was QuitBit, a smart cigarette lighter that keeps track of how often you light up, and allows you to monitor your habit to reduce smoking. Shot Stats was a quantified tennis racket, a device that can measure your swing and lead to improvements on the court. The Make Fashion group exhibited a number of wearables projects. Dr. Trish Flanagan of the School of Visual Arts at the Hong Kong Baptist University brought a number of student projects, including an LED umbrella and a dress that utilized an array electro-mechanical components like those used in German airport signs. (I’ve always wanted one of those large signs for Maker Faire.) Shannon Hoover, who is the organizer of the Maker Faire in Calgary and came to Shenzhen with his wife as vacation, wore his e-tie from his neck. Earlier in the week, he had arranged a tour for me of Dr. Flanagan’s Wearables Lab in Hong Kong before Maker Faire. Stefania Druga of HacKIDemia had spent some 3 months in different countries in Africa, holding workshops for teachers and introducing new methods and tools for making. She was also impressed by the local makers she visited, and showed me photos of a welding shop she visited and others who had created a their own refrigerators from scratch. Check out the photos from her trip. She got sick often on her trip and it sounded like a difficult but ultimately fulfilling journey. During a Maker Cities meetup, organized by the Institute for the Future, a number of people gave short presentations on what is happening in their city: Shenzhen, Shanghai, Beijing, and Tel Aviv. Stefania jumped up and gave an impromptu presentation on making in Berlin. Tom Whitwell headed up a contingent of startups from England, a trip that was funded by the UK government. A former digital editor for the Times of London who wrote an article in Vol 4 of Make on Lego Instruments, Whitwell gave a presentation that reviewed a list of British companies from past to present, from Clive Sinclair to James Dyson, and talked about 2 million Raspberry PIs sold. He asked the question: How is Britain different than other countries? He wanted to find unique differences but he concluded that Britain is not really different. “It is part of a global cultural development,” he said. It is a culture that flows through Britain and America, Japan and China, and other parts of the world, reflecting each other’s ideas and offering new insights. I met groups of makers from many different countries. The excitable Masakazu Tks Takasu from Japan was everywhere, wearing his bunny ears, which move back and forth depending on his level of excitement. He wrote on his Facebook page: “These are my greatful days, my golden era.” I met a group of makers from Singapore along with William Hooi from SG Makers. There was also a group visiting from the Penang Science Center in Malaysia. Joey Hudy traveled from Arizona with his Maker Mom, Julie, and his grandfather to give a presentation. After Maker Faire Shenzhen he visited factories and went to talk to middle school students. 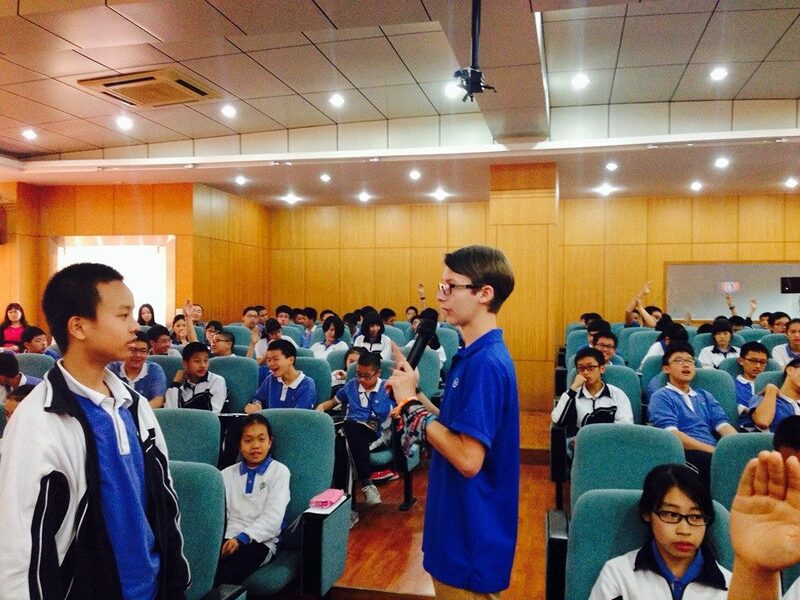 Joey Hudy speaking to students at Shenzhen Middle School. The Century Egg is a preserved egg, meant to last a hundred years. The whole trip was an amazing experience that really opened my eyes. All the people in China that I met were fantastic people and I felt like I have known them all for a lot longer than just 11 days. Leaving Shenzhen felt strange, like I was leaving home in a way. I had a spectacular time learning about China and the culture. As someone who came to Shenzhen for the first time, I found China surprising and different than what I expected — open and friendly, intense and tireless, broad and expansive, informal and optimistic. All the surprises were good ones. The folks from Seeed Studios did such a terrific job on the event and they were so hospitable. I ran into Jeff Sturges of Detroit and Dominic Muren of Seattle in the Hong Kong airport as I was leaving. Both said in their own way that what Joey said: this trip had opened up China to them as a fascinating new world to explore. In the airport, I bought a book to start learning Chinese. I want to come back to keep tabs on all the makers.